This species is accepted, and its native range is Old World to Central & SE. Australia. Annual; caespitose. Culms erect, or geniculately ascending; 10-60 cm long; 3-5 -noded. Culm-nodes glabrous. Leaf-sheaths outer margin hairy. Ligule a fringe of hairs. Leaf-blades 3-30 cm long; 4-10 mm wide. Leaf-blade surface scaberulous; glabrous. Inflorescence a panicle. Peduncle scaberulous above. 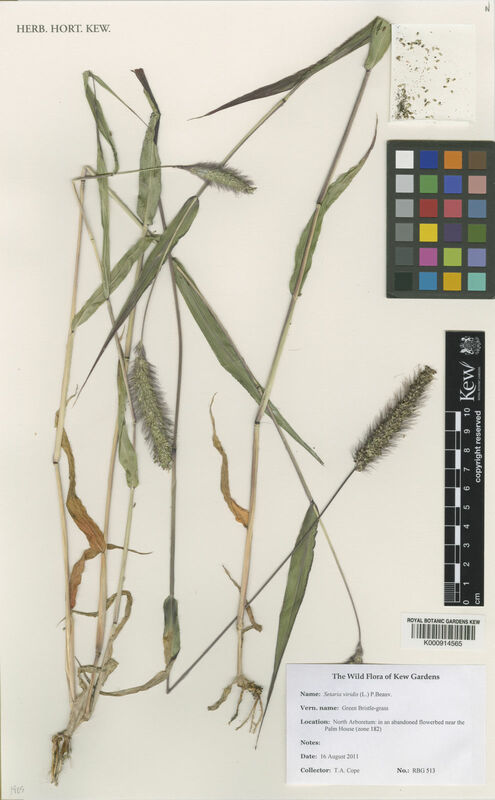 Panicle spiciform; linear; 1-10 cm long; 0.4-1 cm wide. Primary panicle branches accrescent to a central axis; with evident branchlets on axis. Panicle axis hispid, or pilose. Spikelets subtended by an involucre. Fertile spikelets pedicelled; 2-6 in the cluster. Involucre composed of bristles; free throughout; 5-10 mm long. Involucral bristles persistent; few; in one whorl; 4-14 in principal whorl; 1-3 per spikelet; flexible; antrorsely scaberulous; glabrous. Pedicels oblong. Spikelets comprising 1 basal sterile florets; 1 fertile florets; without rhachilla extension. Spikelets elliptic; dorsally compressed; obtuse; 2-3 mm long; falling entire. Glumes dissimilar; reaching apex of florets; thinner than fertile lemma. Lower glume oblate; 0.25-0.33 length of spikelet; membranous; without keels; 1-3 -veined. Lower glume apex obtuse. Upper glume elliptic; 1 length of spikelet; membranous; without keels; 5 -veined. Upper glume apex obtuse. Basal sterile florets barren; with palea. Lemma of lower sterile floret similar to upper glume; oblong; 1 length of spikelet; membranous; 5-7 -veined; obtuse. Palea of lower sterile floret membranous (0.33-0.5 length of lemma). Fertile lemma elliptic; dorsally compressed; 2-3 mm long; indurate; without keel. Lemma surface rugulose. Lemma margins involute. Lemma apex obtuse. Palea involute; indurate. Europe: northern, central, southwestern, southeastern, and eastern. Africa: north, Macaronesia, and northeast tropical. Asia-temperate: Siberia, Soviet far east, Soviet Middle Asia, Caucasus, western Asia, Arabia, China, Mongolia, and eastern Asia. Asia-tropical: India, Indo-China, Malesia, and Papuasia. Australasia: Australia and New Zealand. North America: Subarctic, western Canada, eastern Canada, northwest USA, north-central USA, northeast USA, southwest USA, south-central USA, southeast USA, and Mexico. South America: Mesoamericana, Caribbean, Brazil, and southern South America. Annual; caespitose; clumped densely. Culms geniculately ascending; 30-100 cm long. Culm-internodes smooth; distally glabrous. Leaf-sheaths loose; pubescent; with tubercle-based hairs; outer margin hairy. Leaf-sheath oral hairs ciliate. Ligule a fringe of hairs. Leaf-blade base broadly rounded. Leaf-blades 5-15 cm long; 2-7 mm wide. Leaf-blade surface scabrous; rough on both sides; glabrous. Leaf-blade apex attenuate. Inflorescence a panicle. Panicle spiciform; linear; continuous, or interrupted; 2-9 cm long; 0.5-0.8 cm wide. Primary panicle branches accrescent to a central axis; with evident branchlets on axis. Panicle axis hispid, or pilose. Spikelets subtended by an involucre. Fertile spikelets pedicelled; 2-6 in the cluster. Involucre composed of bristles; free throughout; 2-8 mm long. Involucral bristles persistent; few; in one whorl; 1-4 per spikelet; flexible; glabrous. Pedicels oblong. Spikelets comprising 1 basal sterile florets; 1 fertile florets; without rhachilla extension. Spikelets elliptic; dorsally compressed; 2.5-3 mm long; falling entire. Glumes dissimilar; reaching apex of florets; thinner than fertile lemma. Lower glume ovate; 0.5 length of spikelet; membranous; without keels. Lower glume apex acuminate. Upper glume ovate; 1 length of spikelet; membranous; without keels. Basal sterile florets barren; with palea. Lemma of lower sterile floret similar to upper glume; ovate; 1 length of spikelet; membranous; 5 -veined. Fertile lemma elliptic; dorsally compressed; 2.5-3 mm long; indurate; yellow, or light green; without keel. Lemma surface rugulose. Lemma margins involute. Lemma apex acuminate. Palea involute; indurate. Setaria maximowiczii Tzvelev & Prob. Setaria viridis var. breviseta (Döll) Hitchc. Setaria viridis var. maior (Gaudin) Peterm. Setaria viridis var. robusta-alba M.M.Schreib. Setaria viridis var. robusta-purpurea M.M.Schreib. Setaria weinmannii Roem. & Schult.